Over the next three weeks, college students (and their parents) will spend more than $3 billion on the most essential of all winter back-to-school items: textbooks. The average student spends nearly $700 on textbooks for the new semester, but an increasing number are bringing these costs down by renting their textbooks instead. 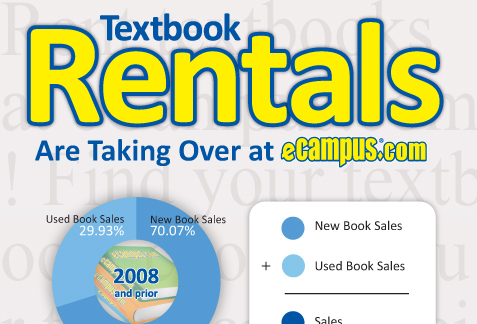 Textbook rentals hardly existed four years ago, but they now account for nearly 48% of all sales. By renting textbooks students can save 60-80% off the list price. Rent your textbooks from eCampus.com and see why so many students are excited about saving tons of cash this semester! To view the full infographic click here.